Elliot speaking to fans at a Faking It panel in West Hollywood, California. 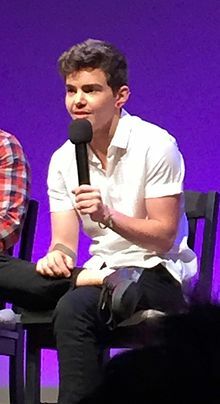 Elliot Fletcher (born June 30, 1996) is an American actor known for his work on the MTV comedy series Faking It, the Freeform drama The Fosters and the Showtime dramedy Shameless. Fletcher was born and raised in Los Angeles, California, by his parents, actors Julia Fletcher and John DeMita. Fletcher joined the cast of Faking It as Noah, in early 2016. In April 2016, the media announced that Fletcher would be joining the cast of The Fosters in a recurring guest-starring role as Aaron, an "attractive and intriguing law student" and potential romantic interest of Callie (Maia Mitchell). Fletcher originally considered auditioning for the role of Cole on The Fosters, but decided against it. The role was later filled by Fletcher's close friend Tom Phelan. Fletcher also appeared in season 7 and then became a recurring cast member in season 8 of the Showtime TV show Shameless. He plays Trevor, a trans man who works for an organization that helps find homes for runaways and homeless LGBT+ teens. He then befriends and gets into a relationship with Ian Gallagher. In 2017, transgender actors and actresses including Fletcher (with the help of GLAAD and ScreenCrush) were part of a filmed letter to Hollywood written by Jen Richards, asking for more and improved roles for transgender people. ^ a b "'The Fosters' Enlists 'Faking It' Breakout for Season 4 (Exclusive)". The Hollywood Reporter. Retrieved 2016-05-03. ^ Bernardino, Shiena (27 April 2016). "'The Fosters' casts 'Faking It' and 'Shameless' transgender star Elliot Fletcher for season 4 | Christian News on Christian Today". Christian Today. Retrieved 10 May 2016. ^ "'Faking It' Casts Trans Actor to Play Trans Character for Season 3". The Hollywood Reporter. Retrieved 2016-05-03. ^ Gilchrist, Tracy (18 February 2016). "Trans Man Elliot Fletcher Joins MTV's Faking It in Show's First Trans Role". Pride. Retrieved 11 May 2016. ^ "Elliot Fletcher talks playing the new trans guy character on "Faking It" - AfterEllen". AfterEllen. 2016-04-05. Retrieved 2016-05-06. ^ "'Shameless': How a Transgender Storyline Brings the Show Back to its Roots". The Hollywood Reporter. Retrieved 24 July 2017. ^ "New Video Breaks Down Why Hollywood Needs Transgender Actors | HuffPost". Huffingtonpost.com. 2017. Retrieved 2017-06-21. ^ Reynolds, Daniel. "Trans Actors Ask Hollywood for Roles With Dignity and Depth in Open Letter". Advocate.com. Retrieved 2017-06-21.